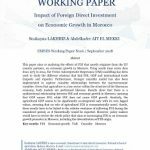 Tunisia faces important employment challenges. In fact, the country has a high unemployment rate. The labour market is often fragmented. Labour productivity is generally low. The high level of informal employment illustrates the vulnerability of employment creation. For all these reasons and more, it is important to assess where progress has been made and to identify key opportunities and obstacles to the creation of productive employment. 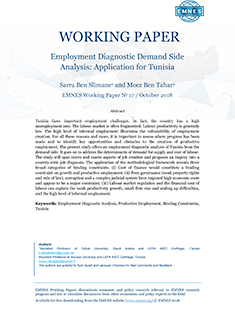 The present study offers an employment diagnostic analysis of Tunisia from the demand side. It goes on to address the determinants of demand for supply and cost of labour. The study will span micro and macro aspects of job creation and proposes an inquiry into a country-wide job diagnosis. The application of the methodological framework reveals three broad categories of binding constraints. (i) Cost of finance would constitute a binding constraint on growth and productive employment. (ii) Poor governance (weak property rights and rule of law), corruption and a complex judicial system have imposed high economic costs and appear to be a major constraint. 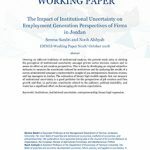 (iii) Labour market regulation and the financial cost of labour can explain the weak productivity growth, small firm size and scaling up difficulties, and the high level of informal employment.